Generally, when people think of pet protection they are thinking of flea and tick prevention, a watchdog to guard the house, or sweaters to keep their dogs insulated during the winter months. But during the sweltering heat that summer can bring, protecting our pets from sunburn and heat stroke are paramount, especially since our pets cannot simply tell us that they are in danger. Did you know that with an outside temperature of 70 degrees, the inside of your car can reach 120 degrees, even with the windows cracked? In fact, in certain conditions, the interior of a car can exceed 200 degrees! There are a variety of things that we can do to ensure our pets continued safety. The easiest way to prevent heat-related health concerns is to provide plenty of fresh water, as well as a shady area (especially for outside pets). This helps to keep the internal temperature down, as dogs and cats are not capable of sweating in the same way that humans are. Another way to protect dogs during the summer is to use sunblock. Light colored dogs, dogs with short coats, dogs with thin or sparse coats, hairless dogs, and dogs that get a “summer haircut” are all susceptible to sunburn. Additionally, many animals like to sunbathe, so applying sunscreen to sensitive areas is generally a good idea (belly, tips of ears, nose, etc.). Be sure to let the lotion soak in before licking can occur, as pets are masters at removing topical ointment. Please be sure to use pet-safe sunscreens, ESPECIALLY FOR CATS. While sunscreens containing Titanium Dioxide are okay, Octyl Salicylate, Homosalate, and Ethylhexyl Salicylate are potentially dangerous. These break down into salicylic acid (asprin), which is toxic for cats. 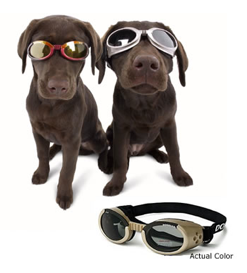 Another helpful item to have on hand is doggles, specially designed dog sunglasses. These help to protect the eyes when it is especially bright outside. They can also help dogs with specific eye conditions, and can even be fit with prescription lenses (depending on your viewpoint, these either look totally fashionable, or totally ridiculous, but either way…they get the job done). So remember, if you think it is hot outside (it was 109 at my house last weekend), you dog thinks it is worse. Make sure to keep your pets safe, and have an awesome summer! Until next time…happy BARFing! Evan Price is a Raw Diet Educator for BARF World Inc. He is a true dog lover at heart with a particular interest in Daschunds. Evan is also an avid sports enthusiast and bridge player. For more articles like these and to learn more about the benefits of raw food for your pets, sign up for The Intelligent Pet weekly e-zine at www.barfworld.com. How Long Is Too Long To Leave Raw Dog Diet Out?